We use hire (rental) cars at The University a lot which gives me the chance to drive a range of different cars. Today the hire car fairy brought me a Vauxhall (aka Opel) Corsa SRI. In yellow. I was quite looking forward to driving it because it’s really popular with car modders, so presumably there’s something a bit special about it, right? Err, yeah. I found that out really rather quickly, but first let me tell you what’s good about it. It feels like good value for money. I’ve driven a few cars that feel like pieces of agricultural machinery with a few pieces of friendly plastic Blu-Tacked to them. The Corsa is pretty solid, well put together. Obviously there have been compromises but there’s nothing that rings out as glaringly cheap. Nothing agricultural. The equipment is clearly a bit of a compromise. Boxes have been ticked, but the features are often difficult to use. Cruise control for instance, it’s there but it’s a bit of a battle compared to more upmarket Vauxhalls. Nevertheless on the road the car is direct and feels very well connected to the road, you can throw it into a corner with confidence and know that you’re not going to be constantly fighting understeer. It’s clearly relatively cheap and if you’re not expecting top class then it’s relatively well equipped. Thanks I suspect largely to the gearing the car is very nippy around town. I don’t live in a town, I live in the middle of nowhere. Sure it’s pretty nippy on narrow country lanes too but as soon as you get out onto wider roads you realise that only the first two inches of throttle pedal travel actually makes any difference. I can accept peaky small engines that have no guts outside the power band – I drive a Japanese car after all – but this engine has nothing in the power band either. 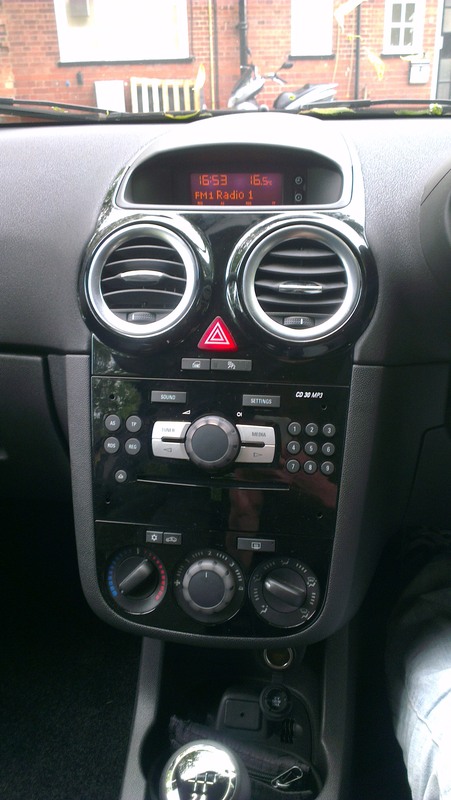 A new car that doesn’t have DAB, USB or Bluetooth. Really? Just a CD player and AM / FM radio. Surely there are laws against this kind of cruelty. I wasn’t in the mood for Radio 4 and I’m not old enough to listen to Radio 2 so I whipped out my hand AUX cable and plugged the phone in. No matter how I tweaked the settings though I couldn’t get it to sound good. So when I stopped for a cuppa I tried tweaking the considerably more extensive graphic equaliser on my phone. Nope, the speakers are clearly made of cheese. This entry was posted in Life, Motorsport on 2014-06-03 by Tom Fosdick.